Learn How to Promote a 'Made in Britain' Business... Without Resorting to Waving a Union Jack Flag! Are you struggling to raise awareness for your business and feel you're battling against a tide of cheap imports? Finding marketing your products with limited time, and on a tight budget, challenging? Wondering what value customers place on the fact that your product is made in Britain? Worrying about what effect Brexit will have on businesses that manufacture in the UK? This one day conference will provide you with the knowledge and expertise you need to successfully promote and sell a brand that is made in Britain. The marketing strategies that other brands are using to promote their ‘Britishness’ without resorting to waving a Union Jack flag! The Make it British Forum is ideal for business owners, senior decision makers and entrepreneurs within the UK fashion and textile industry. Whether you currently manufacture in the UK, or hope to do so in the future, this unique event will inspire you to take action. With a background in design and buying, spanning 25 years, Kate gave up her corporate career after becoming frustrated with UK fashion companies dependence on Far Eastern suppliers. Predicting that a UK manufacturing base would one day be essential to remain competitive, Kate has regularly appeared on TV and in the press espousing the benefits of manufacturing locally. She set up Make it British in 2011 as a way of providing British-made businesses with a platform to promote what they do, and make the most of their ‘made in the UK’ label. 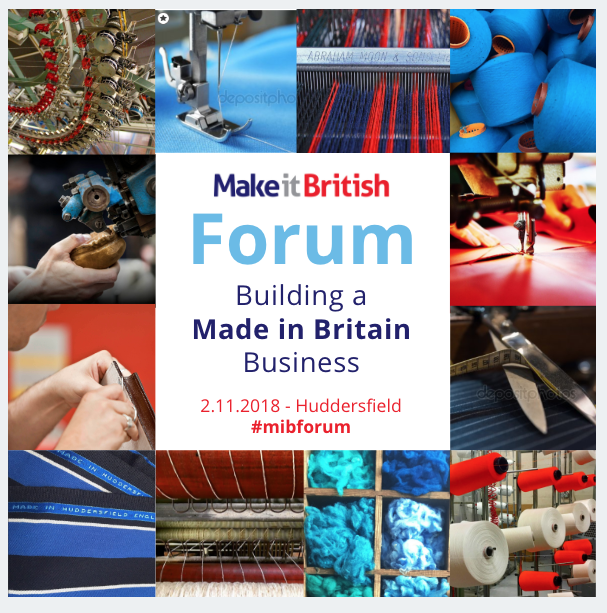 This year's Make it British Forum is taking place in the historical textile town of Huddersfield in West Yorkshire. Do you have any special deals with local hotels? Details of local hotels and rates can be found here. Just mention the Textile Centre of Excellence when you book. Can I attend if I haven’t already registered my company yet? Will you be filming the talks? Will you be doing another event like this in other locations? As much as we are a family friendly company, we cannot accommodate infants at the Forum. What’s the nearest train station? Do you cater for those with food allegies? Yes. Please contact us to transfer the name on your ticket no later than seven days before the event.